The 2001 World Youth Championships in Athletics was the second edition of the World Youth Championships in Athletics. It was held in Debrecen, Hungary from July 12 to July 15, 2001. Aleksey Dmitrik of Russia won the high jump. 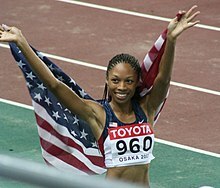 Allyson Felix of the USA won the gold in the 100 metres and the medley relay. Silke Spiegelburg won the pole vault gold for Germany. ^ a b "IAAF World Youth Championships". GBR Athletics. 2007. Retrieved 2008-08-23.